Mazda takes a shot at the BMW X3 with it’s new SUV called the CX-7. The CX-7 is derived from the Mazda Crossport concept which it had been showcasing at some autoshow exhibitions lately. It’s evident the CX-7 takes it’s styling cues from the delicious Mazda RX-8. It’s a cross-over SUV type of vehicle which basically means it’s something like a sports car with SUV practicality. Very “zoom-zoom” indeed. And check this out, the original MX-Crossport comes with with 4 bucket seats for the front and rear seats. 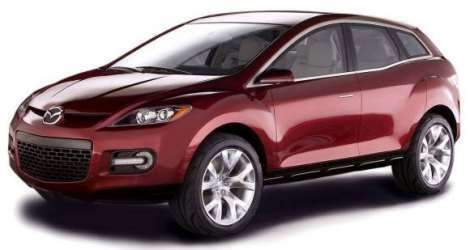 Don’t know if this will be in the production CX-7 model or not. It runs on 275/45/R20 wheels… huge! But the height of the MX-Crossport is only 1.6 meters, lower than others in it’s class. The car is built to be low and wide with a long wheelbase, similiar to what Honda did with it’s new Honda Odyssey. 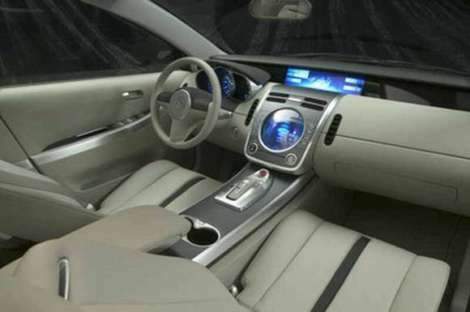 Doubt that funky interior will be in the production version… too funky! :P The car is very Mazda indeed. Sports car blood in everything, even SUVs. I really think Proton is trying to be Mazda sometimes. The CX-7 will begin production in 2006.